It is hard to make a blanket recommendation when the Hanna Kay mattress pad isn't even sold in all standard US bed sizes. This product is a great pinch hitter, but there are other similar mattress pads at a similar price point that are more dependable and available in more sizes. 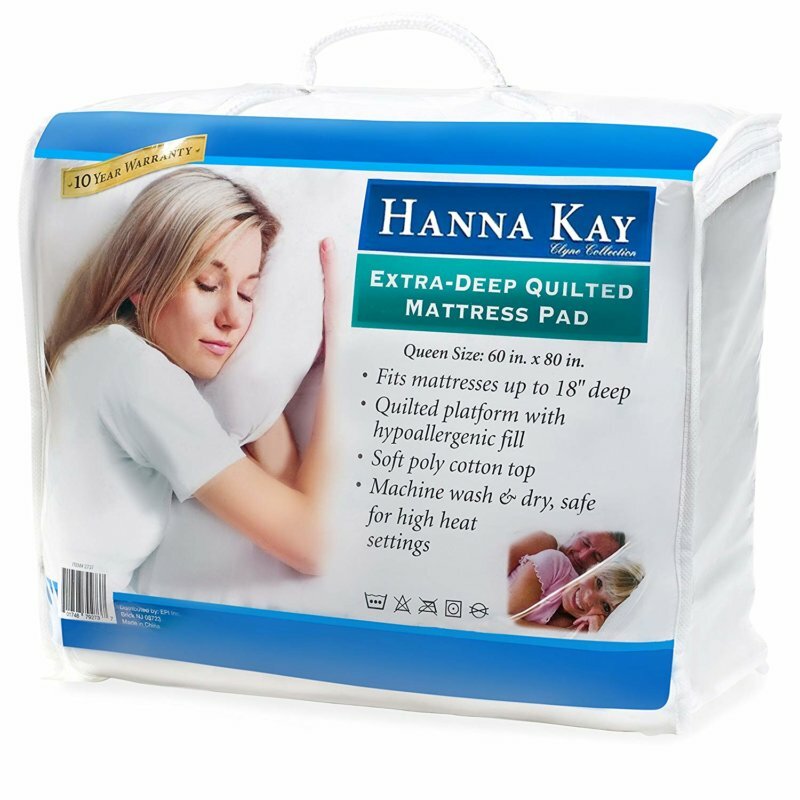 What Is the Hanna Kay Extra-Deep Quilted Mattress Pad Made From? How Does the Hanna Kay Extra-Deep Quilted Mattress Pad Perform? How Do You Wash the Hanna Kay Extra-Deep Quilted Mattress Pad? How Much Does the Hanna Kay Extra-Deep Quilted Mattress Pad Cost? Hanna Kay is one of a handful of brands under USA Enterprises, a company that’s been around for more than half a decade. Other brands include Dr. Kay’s and Epica, though Hanna Kay is the only one focused on bedding. You may find Hanna Kay products sold by both online and physical retailer across the US. The Hanna Kay Extra-Deep Quilted mattress pad is highly rated on Amazon and other online retailers. Does it live up to its stellar reputation? That’s what we wanted to find out in this review. Like many mattress pads, Hanna Kay’s is made from cotton and polyester. Worth noting, though, that the amount of cotton actually used here is much less than average. 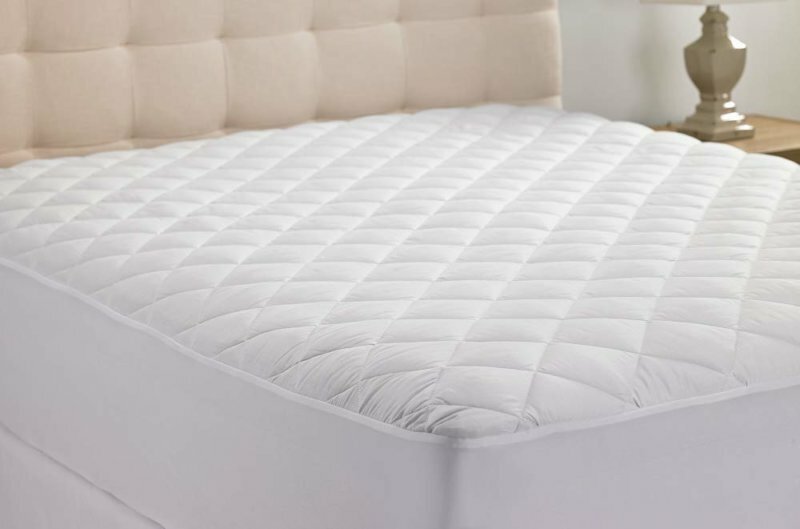 The quilted surface of the Hanna Kay mattress pad is a poly-cotton blend, but it’s 20% cotton and 80% polyester. That ratio is very different from The Grand mattress pad’s 50-50 fabric blend, for example—and The Grand is already within the same price range as Hanna Kay. A stark and prominent diamond pattern is used for the quilting. Fare from being “specialized” as the brand claims, this design actually makes the Hanna Kay mattress pad look similar to many others on the market. You may even mistake it for more expensive options like the Luxor Linens Francisco mattress pad at first glance. The 100% polyester batting inside the quilting is almost industry standard for these kinds of baseline mattress pads. Note, though, that Hanna Kay boasts of their mattress pad having “40% more fill than average” and using poly filling that is “luxury-quality” and “uniquely” hypoallergenic. The side panels or the skirt is also made from 100% polyester knit. The fabric here is very thin and almost like sheer stockings. When it stretches—and it will, as Hanna Kay says it uses “stretch-to-fit technology”—it’s almost see-through. Is the Hanna Kay Mattress Pad a Fitted Mattress Pad? Yes, it is. The skirt fabric already benefits from its “stretch-to-fit technology”, and that along is enough to call it a fitted mattress pad. It also features elastic bands on the edges. There are slightly different from the elastic bands that are common in fitted sheets, though. Like the rest of the skirt, they’re very thin and can feel flimsy. Will the Hanna Kay Mattress Pad Fit Your Mattress? Let’s start with that’s good about the Hanna Kay mattress pad: the depth. As its name implies, this mattress pad is supposed to be “extra-deep”, but it’s no more accommodating than other pads we’ve reviewed. Nevertheless, it can be used on mattresses and bed setups up to 16 inches thick. You can easily use a thick mattress topper over an industry standard mattress and have the Hanna Kay mattress pad snugly hold it all in place. That way, everything can be secure and tight under your bed sheets. Now for the bad news: The Hanna Kay mattress pad only comes in four standard US bed sizes. Twin, full, queen and king are available. If you own a twin XL or a California king, you’re out of luck. It gets even worse: As of this writing, only twin and queen sizes are in stock, as shown on the mattress pad’s Amazon product page. While it is a top-rated product on several online retailers, customer feedback is divided. Most complaints about the Hanna Kay mattress pad involved fabric pilling upon washing and fit issues for thinner mattresses. Reports from verified customers range from glowing recommendations to angry rants. Why? We think it has to do with the wording on the product page, which seems to keep changing. Allegedly promoted as “Made in USA” when it fact the packaging clearly states that it is made in China. Allegedly listed as waterproof, but the product page now notes that it is not. Promoted as using “stretch-to-fit” technology, but some find it too loose for mattresses up to 10″ thick. Promoted as having “40% more fill”, but most find it doesn’t add significant cushioning or plushness at all. Several customers reported the queen size Hanna Kay mattress pad’s quilted surface being about an inch smaller all around when fitted over a standard queen mattress. A few customers questioned the “better breathability” claim of the Hanna Kay mattress pad, as they found they slept hot with the product on their mattress. Of course, the Hanna Kay mattress pad wouldn’t be so highly rated without corresponding positive reviews. Consumers often cited affordability as the main advantage here, but other details were also praised: fit, breathability, effectiveness at protecting the mattress from dust and other allergens, and the warranty coverage. How Does the Hanna Kay Mattress Pad Feel? The Hanna Kay mattress pad is not really supposed to feel like it adds extra softness or comfort. If you are looking for that, you may want to find a mattress topper. Looking for something that’s waterproof? You may have more luck with a mattress protector. When we look at how a mattress pad feels, we ask the important questions. Is the mattress pad surface smooth or does it bunch up? Does the fabric make you itchy or make you sweat more often? Does the mattress pad make noises when you move around on the bed? No, the Hanna Kay mattress pad does not bunch up. You can thank the diamond pattern quilting for that. No wonder that design is so popular! The mattress pad shouldn’t make you itchy or make you feel hot and sweaty, but a handful of negative reviews prove that this isn’t always the case. While the average experience tells us that it is breathable, some consumers disagree! Plus, the high percentage of polyester used makes this mattress pad susceptible to static cling, which can be uncomfortable. Because the mattress pad isn’t waterproof, it doesn’t have a vinyl back, so there should be no sound at all. Is the Hanna Kay Mattress Pad Hypoallergenic? The Hanna Kay mattress pad is said to be hypoallergenic, and most consumer reviews do support the claim. Polyester and cotton are already known as good fabrics to use if you’re allergy-prone! Unless you’re particularly sensitive to polyester, there should be no problem. While we’re not exactly sold on the small amount of cotton present in the Hanna Kay mattress pad, it does seem to function well—as long as you don’t expect it to be anything more than baseline. It will prevent animal hair, body oils, dander, dead skin cells, dust, sweat and more from reaching your mattress surface. And you most likely won’t feel uncomfortable while it does its job. Does the Hanna Kay Mattress Pad Smell? Some consumers states that they notice a faint plastic smell on the Hanna Kay mattress pad upon unpacking it for the first time, but most don’t report any smell at all. The odor is almost sure to come from the plastic container the mattress pad comes in. Also, it’s important to note that off-gassing is not always observable through your sense of smell. What does that mean, then? If you are really worried about trace chemicals, you really should wash the mattress pad before using it for the first time—whether or not it smells. If you’re not as finicky, you may also leave it in a well-ventilated area to air it out. The scent should disappear after a few minutes or hours. Hanna Kay states that their mattress pad comes with “no special washing instructions”. You may machine wash it “with your other laundry” and use “even the highest power” washers and dryers. The reality, though, may be different. It’s our recommendation that you follow the usual mattress pad care instructions if you can—that is, machine wash with mild detergent and tumble dry low every two to three months. After all, what can it hurt to be more cautious? Who wants a mattress pad to accidentally soak in bleeding colors from other items, or inadvertently shrink or warp? While consumers noted that stitching mostly held up, some had concerns about the durability of entire skirt area: the polyester knit, the stitching, and the elastic band near the edge. A few noted that they may alter their customer reviews based on how the mattress pad would perform upon multiple washings, but we didn’t see any of those calling attention to really big problems. The Hanna Kay mattress pad seems to be strong enough to withstand washing again and again, but while it doesn’t fall apart or tear, it is prone to significant pilling. This doesn’t prevent the mattress pad from being completely functional, but it may point to accelerated wear and tear of the fabric the longer you use it. As of this writing, one queen size Hanna Kay mattress pad is available on Amazon for $24.95. Here’s something odd: The twin size Hanna Kay mattress pad looks to be listed at the same price! It’s typical for mattress pad brands to scale the price up with sizing—not true for Hanna Kay, it seems. Does Hanna Kay Offer a Trial Period, Return Policy or Warranty? There is a 10-Year “Shield It” Guarantee mentioned on the Amazon product page for Hanna Kay mattress pad. What does this entail? According to Hanna Kay, they will accept mattress pad returns with no questions asked and give you a 100% refund should you “stop loving” it. Not a bad deal! Visit Amazon & Find Hanna Kay Mattress Pad Deals Now! Nothing stands out with the Hanna Kay mattress pad, except for the 10-year guarantee, and even that is suspect. As the brand has no official website—and therefore no easily searchable customer support services—it’s not immediately obvious how to go about making a return. Where are the guarantee details? Is it advisable to keep the original packaging? Do you need your official receipt? Are refunds in cash or credit? We needed these questions answered, but we didn’t know where to ask. Because the Hanna Kay is affordable, though, it’s easy to just throw caution to the wind. It is hard to make a blanket recommendation when the Hanna Kay mattress pad isn’t even sold in all standard US bed sizes. This product is a great pinch hitter, but there are other similar mattress pads at a similar price point that are more dependable and available in more sizes.